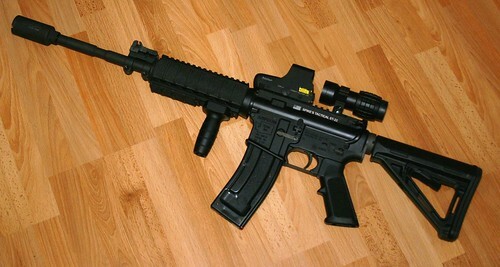 Home › General › Spike’s Tactical AR-22: one year later. Spike’s Tactical AR-22: one year later. I’ve now had my Spike’s Tactical AR-22 for more than a year. Its now on a different lower than it originally was, has some different accessories, and has lots of ammo through it! Go to the original review. In 2009, i put more than 2300 rounds through it, with only 27 failures. And of those 28, 15 were on one day early in February, where i tried to use CCI Mini-mags. Lets just say that it doesn’t like those! I also think i went through a bad batch of ammo in January, where i had ~100 light strikes or duds. It happened with 2 separate lowers, so I don’t think it was hammer or spring related. Since i got it, i’ve added an Eotech (off an ebay pawn shop :)), and a knockoff magnifier. I didn’t spend a lot on the magnifier because i wasn’t sure how well the setup would work, or if i’d like the combination or not. For a cheapo magnifier, it actually works pretty well. I got a used noveske kx3 flash hider, but mostly for looks. The barrel isn’t short enough to really need it, although i am tempted to have the barrel cut down and have the kx3 permanently mounted. Tempted, but not sure. From March of 2009 to date, i’ve only had 2 failures, both failures to feed, and one bad round in 1600+ rounds. I started keeping really detailed logs a few years ago. I may be off by a few rounds, but not by much! In the previous review, i talked about how much cheaper .22lr ammo was than .223 or 5.56. Since then, the price of 22 has gone up a bunch, and the cost of .223/5.56 has come back down to a more reasonable (read: non-panic) price. Because of this, i also have an AR chambered for 5.56, so i shoot that too, and shoot my spikes’s 22 a little less often.